TBUG Townsville Tandems aims to give people with a disability the opportunity to enjoy all that cycling has to offer. We operate by pairing up people who have a disability (and are unable to ride safely by themselves) with competent cyclists, called Captains. Our club rides are relaxed, social rides on cycle paths around Townsville, normally for two hours on a Monday afternoon. The training rides are normally at 6.00am on Saturday morning we participate in a bunch ride with solo cyclists travelling between 25 / 30 km/h for two hours and we always finish off in a coffee shop. We can also provide pathways for cyclists interested in competitive tandem riding with support for training and developing the sport in Townsville with the local cycling clubs..
TBUG Townsville Tandems currently uses 4 tandem bikes; two Pegasus Brumby's on loan from Sporting Wheelies, one Polygon Impression (click links to see photos) and one Apollo tandem. If you have further questions about how TBUG Townsville Tandems works, have a read through our Frequently Asked Questions. Who's behind TBUG Townsville Tandems? ﻿Townsville Tandems was launched by Phil Stolk in May 2014. Phil is a keen cyclist who began riding tandems in Wollongong in 2007 with the Exsight Tandem Team - a similar cycling club for blind and vision-impaired cyclists. 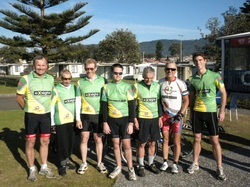 Phil (far right) is pictured with some o﻿f the other Exsight riders. To keep up-to-date with what's been happening at TBUG Tandems, check out our Latest News.